Hannan’s Josie McCoy (2) returns a serve during the Lady Wildcats’ volleyball match against Buffalo on Thursday night in Buffalo, W.Va.
BUFFALO, W.Va. — Give credit to Hannan for hanging tough at least. 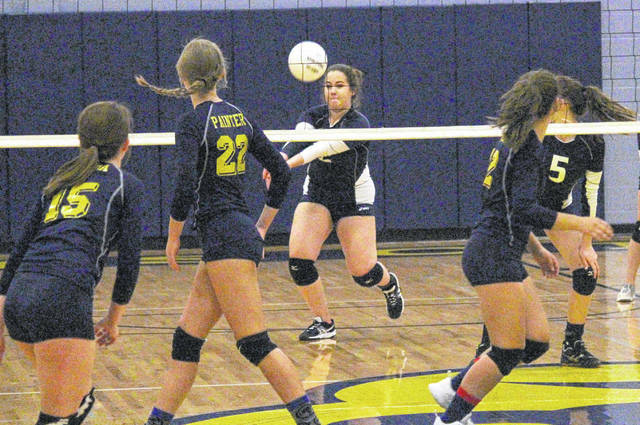 Unfortunately for the Lady Wildcats, though, the host Buffalo Bison were too much of a bully on Thursday. That’s because the Bison — on its Senior Night —swept Hannan for the second time in 10 days, defeating the Lady Wildcats 25-19, 25-20 and 25-15 in the rematch. The contest also marked the regular-season finale for both clubs, as Class A postseason tournament play begins next week. While Hannan never led in the opening game, it did rally from an early 5-0 deficit to forge a 7-7 tie — before Buffalo broke free for five more points and the Wildcats were never closer than three points the remainder of the way. In game two, the Bison again raced out to a 5-0 lead, but once again Hannan rallied for ties of 10-10 and 13-13, before scoring four straight points of its own to take a 17-15 advantage — its largest of the entire match. From there, however, the Wildcats could not hold an 18-17 lead — giving up eight of the final 10 points in the set and falling 25-20. In the third game, Hannan held a brief 1-0 edge, but the Bison bolted for a 4-1 lead on four straight service points by Rowen Samms — and only continued to expand its advantage after leading 14-10. With the win, Buffalo ended its regular campaign at 6-31, while the Wildcats conclude their slate at 3-17. Hannan had wins over Huntington St. Joseph’s junior varsity squad twice and Van once, but Buffalo swept the Lady Wildcats in straight games again. In fact, Hannan had few points outside of Bison errors, as it only accounted for six total kills and five aces. In game one, Pammie Ochs and Josie McCoy managed kills, as a McCoy ace and a net violation got the Wildcats to within 17-14. Another net violation and a hitting error trimmed their deficit to 22-17, as Josie Cooper served up a pair of aces to make it 22-19. But Buffalo senior Kaitlin Janda, who had three consecutive aces to make it 21-14, netted a kill —before back-to-back aces by Lindsey Russell ended the game. McCoy had another kill in the second set, before Halie Johnson’s back-to-back aces had Hannan in the lead for the first time at 16-15 —and again at 18-17 on her kill. But Janda, after a Hannan service error tied the game at 18-18, served for five more points which included a pair of aces. A pair of errors allowed the Wildcats to get within 23-20, but Hannan had two errors of its own to give the Bison the 2-0 lead. In game three, the only non-error Hannan points were a Hailey White kill that made it 14-10 —and another Ochs kill that made it 19-12. The Bison got a sideout on a service error to make it 24-15, then the senior Samms served up the match-clinching ace. Buffalo’s Brooke Slaubaugh had a match-high five kills, while Janda and Janessa Harris had four apiece with Janda amassing eight aces. Brookelyn Painter posted three kills, as Russell added another second-set ace. The Bison’s third senior — Kaela Cobb — collected five second-set aces, including four in a row as part of five service points to open that game. In game one, she opened with four service points for the first 5-0 advantage — after Buffalo gained the served on a sideout. Hannan will return to Buffalo High School on Monday, when it begins Region 4 Section 1 tournament action at 5 p.m.